Portrait by Konstantin Somov (1906). Vyacheslav Ivanovich Ivanov (Russian: Вячеслав Иванович Иванов) (February 16, 1866 – July 16, 1949) was a Russian poet and playwright who was a leading figure in the Russian Symbolist movement. He was also a philologist, philosopher, translator, and literary critic. Russian Symbolism was an intellectual and artistic movement predominant at the end of the nineteenth and beginning of the twentieth century. It represented the Russian branch of the Symbolist movement in European art, and was mostly known for its contributions to Russian poetry. Symbolism developed after the Realist movement had exhausted itself. The era of the great Russian novel had come to an end. Symbolism represented a new artistic strategy, one that avoided the attempt to depict reality for one that attempted to evoke a feeling. Symbolism coincided with the decline of the role of the aristocracy and the rise of urban society. In the case of Ivanov, it also reflected a spiritual quest with the poet serving as the prophet. Born in Moscow, Ivanov graduated from the First Moscow Gymnasium with a gold medal and entered the Moscow University where he studied history and philosophy under Sir Paul Vinogradoff. In 1886 he moved to the Berlin University to study Roman law and economics under Theodor Mommsen. During his stay in Germany, he absorbed the thoughts of Friedrich Nietzsche and German Romantics, notably Novalis and Friedrich Hölderlin. In 1893 Ivanov met Lydia Zinovieva-Annibal, a poet and translator. After both divorced their spouses, they married five years later, first settling in Athens, then moving to Geneva, and making pilgrimages to Egypt and Palestine. During that period, Ivanov frequently visited Italy, where he studied Renaissance art. The rugged nature of Lombardy and the Alps became the subject of his first sonnets, which were heavily influenced by the medieval poetry of Catholic mystics. At the turn of the twentieth century, Ivanov elaborated his views on the spiritual mission of Rome and the Ancient Greek cult of Dionysus. He summed up his Dionysian ideas in the treatise The Hellenic Religion of the Suffering God (1904), which traces the roots of literary art in general and the art of tragedy in particular to ancient Dionysian mysteries. 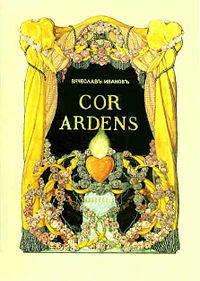 Somov's frontispiece for Ivanov's book Cor Ardens (1907). Influenced by Nietzsche's The Birth of Tragedy, Ivanov divided artistic creation into Apollonian and Dionysian impulses. Steeped in Ancient Greek mythology as well as Christian theology, Ivanov's views about poetry were Neoplatonic. His poems from this period, including "Incarnation," "Spirit," and a cycle of poems known as "The Realm of Transparency" contain Neoplatonic images of the soul seeking the higher, spiritual realms and the deity descending into the human realm. Ivanov's first collection, Lodestars, was published in 1903. It contained many of his pieces written a decade earlier and was praised by the leading critics as a new chapter in Russian Symbolism. The poems were compared to Milton's and Trediakovsky's on account of their detached, calculated archaism. In 1905 Ivanov made his triumphant return to St Petersburg, where he was much lionized as a foreign curiosity. A turreted house where he and Zinovieva-Annibal settled became the most fashionable literary salon of the era, and was frequented by poets (Alexander Blok), philosophers (Nikolai Berdyayev), artists (Konstantin Somov), and dramatists (Vsevolod Meyerhold). The latter staged Calderon's Adoration of the Cross in Ivanov's house. The poet exerted a formative influence on the Acmeism movement, whose main tenets were formulated in the turreted house. His wife's death in 1907 was a great blow to Ivanov. Thereafter the dazzling Byzantine texture of his poetry wore thin, as he insensibly slipped into theosophy and mysticism. The poet even claimed to have had a vision of his late wife ordering him to marry the daughter by her first marriage. Indeed, he married this step-daughter in 1910; their son Dmitry was born two years later. 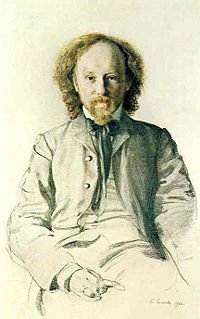 Upon their return from an Italian voyage (1912-13), Ivanov made the acquaintances of art critic Mikhail Gershenzon, philosopher Sergei Bulgakov, and composer Alexander Scriabin. He elaborated many of his Symbolist theories in a series of articles, which were finally revised and reissued as Simbolismo in 1936. At that time, he relinquished poetry in favor of translating the works of Sappho, Alcaeus, Aeschylus, and Petrarch into Russian. In the abysmal years following the revolution, Ivanov concentrated on his scholarly work and completed a treatise on Dionysus and Early Dionysianism (1921), which earned him a Ph.D. degree in philology. The new Communist government didn't allow him to travel outside the Russia until 1924, when he went to deliver lectures on classical philology at Baku University. From Azerbaijan he proceeded to Italy, where he settled in Rome, finally converting to Roman Catholicism in 1926. His last collections of verse were the Roman Sonnets (1924) and the Roman Diary (1944). Many other poems appeared posthumously. Ivanov died in Rome in 1949 and was interred at the Cimitero Acattolico, not far from the graves of Karl Briullov and Alexander Ivanov. Ivanov not only helped to instigate the symbolist movement in Russian poetry, but his academic and literary criticism was also influential as well; in particular, his interpretation of the Russian novelists, Nikolai Gogol, Fyodor Dostoevsky and Leo Tolstoy. "Starting in 1911, Ivanov wrote several long essays on Dostoevsky which eventually became the basis of a German book, Dostojewskij: Tragödie—Mythos—Mystik (1932). Ivanov's reading of Dostoevsky was a major step in the direction of a symbolic, multileveled and dialogic interpretation of Dostoevsky's novels, widely accepted by Western scholars. He coined the term novel-tragedy for Dostoevsky's novels and read them as religious allegories of the human condition, analogous to the myths of Greek drama." ↑ Terras, A History of Russian Literature, pp. 404-5. This page was last modified on 2 April 2008, at 09:40.